It feels like forever since I’ve written here and I feel terrible about it. I’ve been fixing up all the broken images here, reading past posts and looking at old photos and thinking I need to get back into this. Then, as if in answer, Baby Girl comes home from school yesterday and says, “Mommy, I’m starving, I only ate peaches for lunch.” She’s reached a point in school where she looks at the plate and doesn’t like what she sees. Buddy still just shovels it all into his mouth because food is food and if you don’t eat fast enough, you don’t eat. 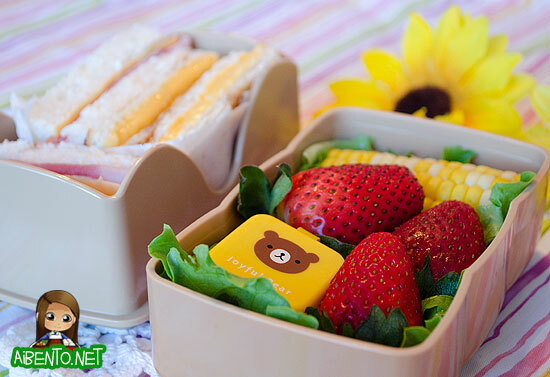 So anyway, no self respecting bento mom can let her daughter eat just peaches for lunch. We headed to the market and bought some things for some lunches she’d like. We took out the school’s lunch calendar and I had her mark all the lunches she does like (because the food isn’t always bad) and on the other days, I’ll pack her something. Since I’m not working at the moment, I’ve got lots of time in the morning to get it all ready without my head feeling like it’s going to explode. It’s weird, having it be this way. I used to wonder what it would be like to just be a mom and not have to worry about packing lunch and getting myself ready in time for work. I used to think I’d hate it, but honestly, it’s refreshing. That being said, my job search continues. In the meantime, I’m looking for freelance editing work, so if any of you know of someone who needs one, please shoot them my way. She couldn’t decide between grilled cheese and ham and cheese sandwiches, so I offered to pack her both. I cut up a piece of wax paper to wrap them in to keep them separate. The bread we bought was too small to be cut to fit the width perfectly, so I ended up putting three long strips and one shortened one at the end. 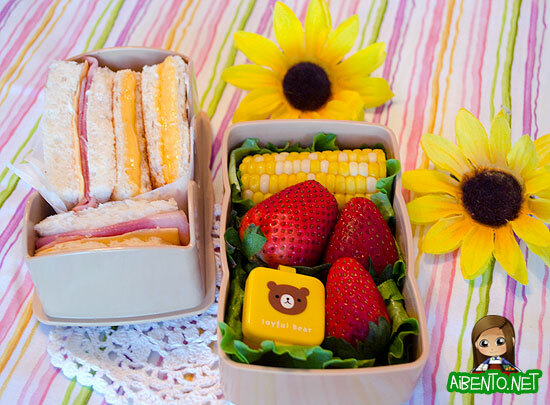 The bottom layer has strawberries with half a corn. In the little bear container I put a little bit of sugar for her to dip the strawberries into. On the side, we packed a little packet of senbei for a snack. I’m excited that she’s finally truly open to bento. It used to be that I had to nag and whine, “Don’t you want a bento?” only to be met with a curt, “Nah.” I guess I just had to be patient. Though, she’s in the fourth grade now. She sure made me wait a long time!